My kids saw the movie Dolphin Tale, and they went through a mini obsession with dolphins. I love taking advantage of those when they are interested in a subject and dive into it. My kids had a blast learning about dolphins, so I wanted to share the resources we used. They wanted to know everything about dolphins, so this momma was online for a few days pulling it all together. I hope this dolphin unit study saves you some time! We love the let's read and find out book series. They have several stages for different ages, but there is so much info in the books paired with bright, colorful pictures. Here is how we turned the book Dolphin Talk into a whole unit on dolphins. 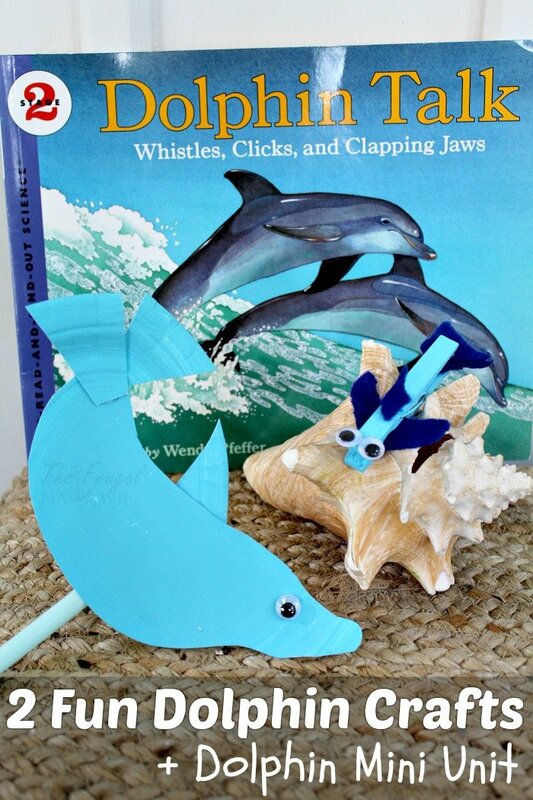 I have got two kids dolphin crafts along with a printable I created and a bunch of other resources we used! Puppets are a fun way for kids to act out the stories they read or to interact with others. 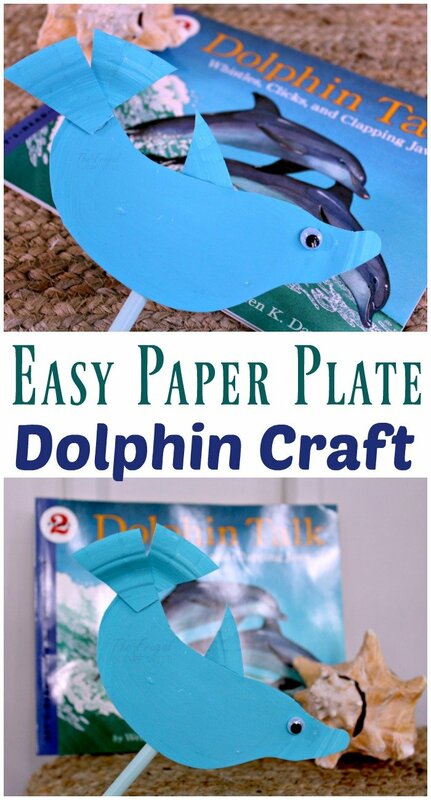 This paper plate dolphin craft for kids is a simple way to learn about dolphins while having fun. You only need a few common crafting supplies, and when you are done kids can use their puppet in so many ways. 1. 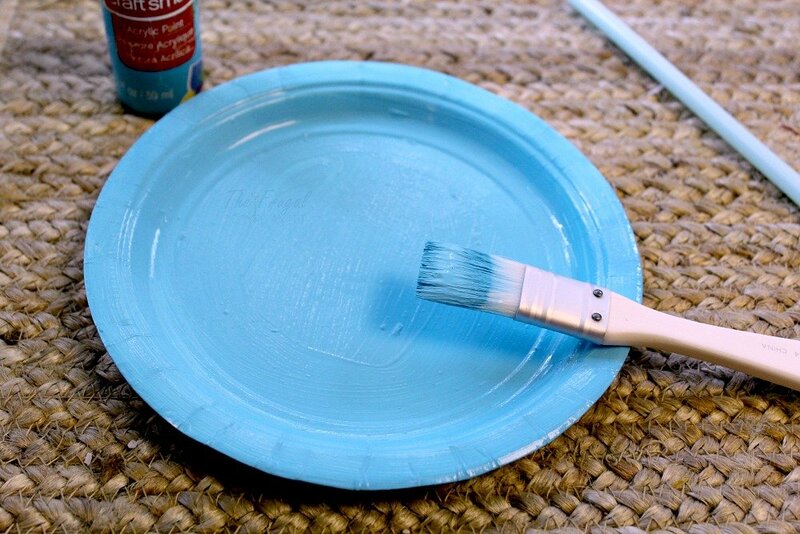 Begin by applying a coat of blue craft paint to the paper plate. You only need to paint one side. Allow the paint to dry. 2. 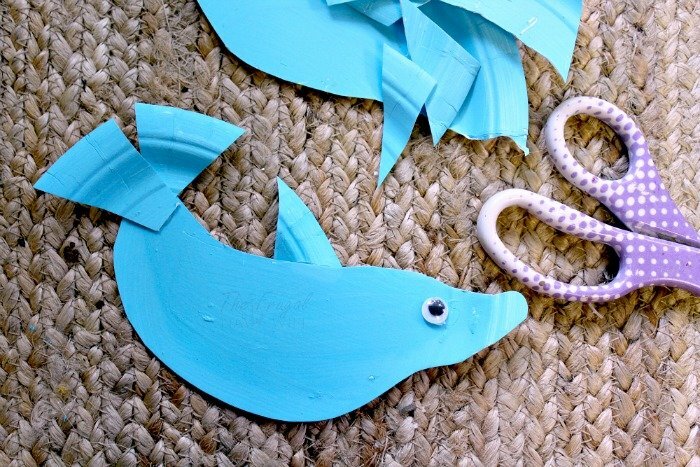 Once the paint is dry, cut out a simple dolphin shape. A curved body is all you need. 3. Using the remaining plate pieces, cut out some simple fins. You will need a fin for the back of the dolphin as well as tail fins. 4. 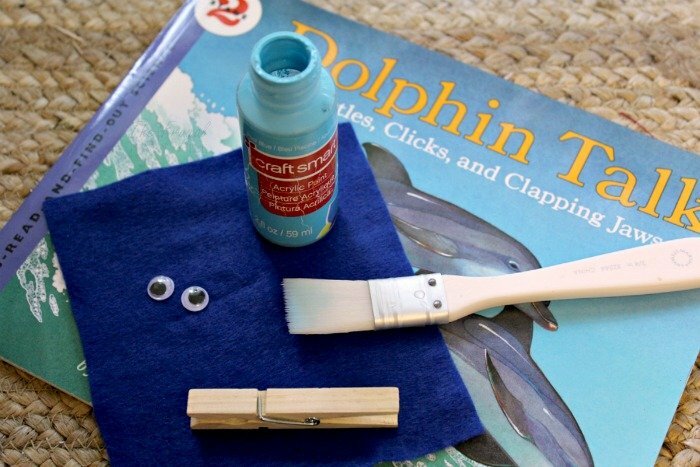 Add a dab of glue to the back of a googly eye and press it to the face of the dolphin. 5. Now add the fins. A simple dab of glue will do the trick. Just dab and press to the top and end of the dolphin. 6. 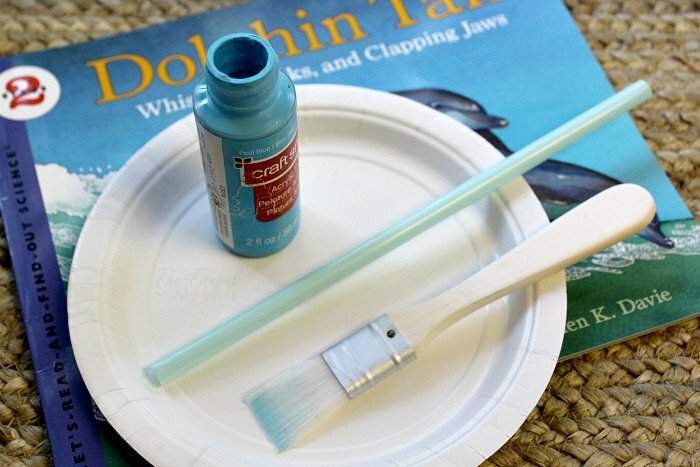 Add one last drop of glue to the back of the dolphin and press it to the craft stick or straw. Once your dolphin is dry, it is ready to be used and displayed. It makes for a great reading buddy! 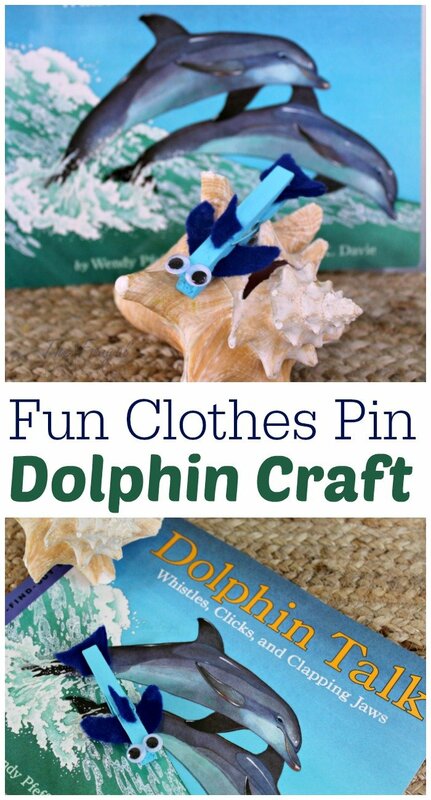 Create this adorable dolphin clothespin craft to accompany your learning about dolphins related texts and lessons. It is easy for kids of all ages and can be created in under 30 minutes using basic crafting supplies. 1. 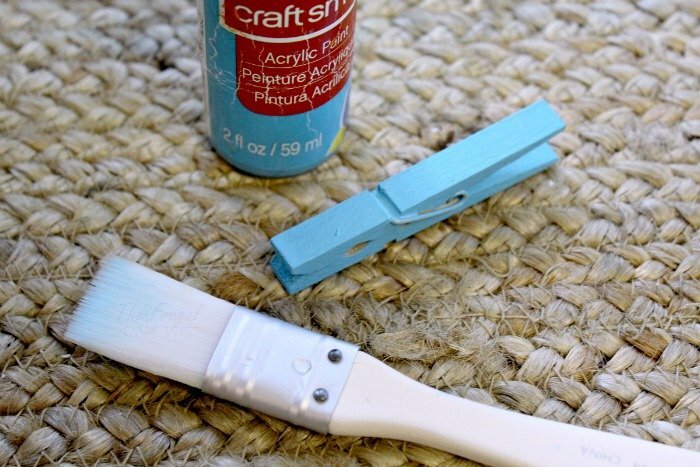 Begin by applying two coats of the blue craft paint to the wooden clothespin. Allow coats to dry in between application. 2. While the paint dries, you can create the fins and tail of the dolphin. Using your felt or paper, cut out a small curved triangle for the fin, a pair of fins for the side, and a curved tail as shown. Just freehand these, as they don’t have to be perfectly symmetrical. 3. Add a dab of glue to the small fin and press it to the top of the clothespin. 4. Add a dab of glue to the side fins and tail and press to the clothespin as shown. 5. Take the eyes and dab some glue behind each, press to the top of the clothespin. 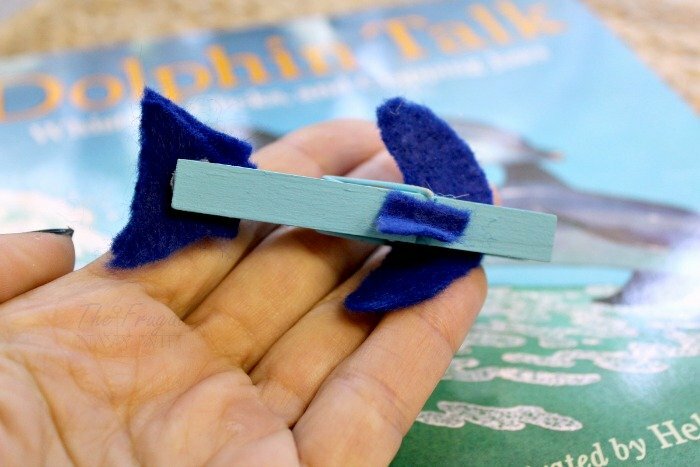 Once the glue is dry you can use your dolphin clip as a bookmark, as a clip to hold items together, or even as a puppet or reading buddy. I made a printable to go with this book for my youngest who wanted to be included in our lesson! You can grab a copy of this 10-page printable pack with a maze, word search, dolphin park labeling, drawing activity, sorting activity, missing letters, connect the dots, and graphing game. Best of all the printable is FREE in my shop right now! Here are a few other printables that we used. Of course, we suggest the Dolphin Talk book for learning about dolphins but we also read a few others. Here are two slightly more advanced chapter books to add in too if your children are old enough. Or they make great read alouds. 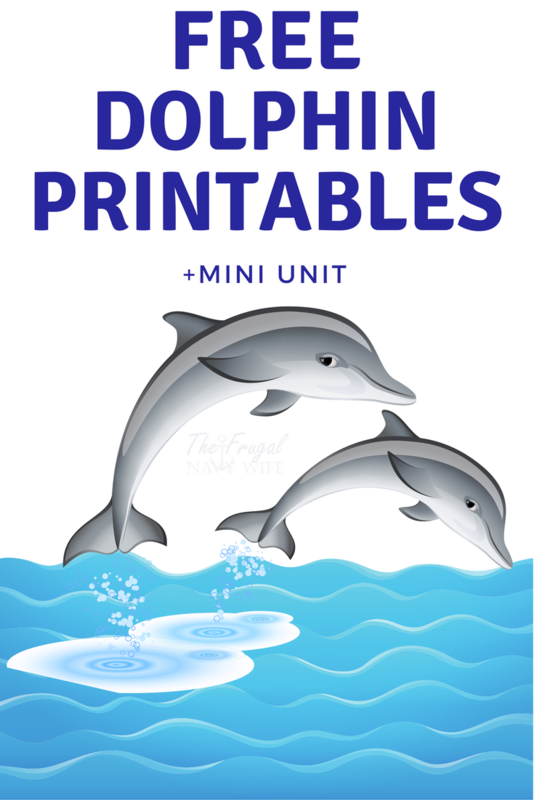 Island of the Blue Dolphins – There are so many printable and unit studies to go along with this book as well! We hop you will ahve just as much fun learning about dolphins as we did! 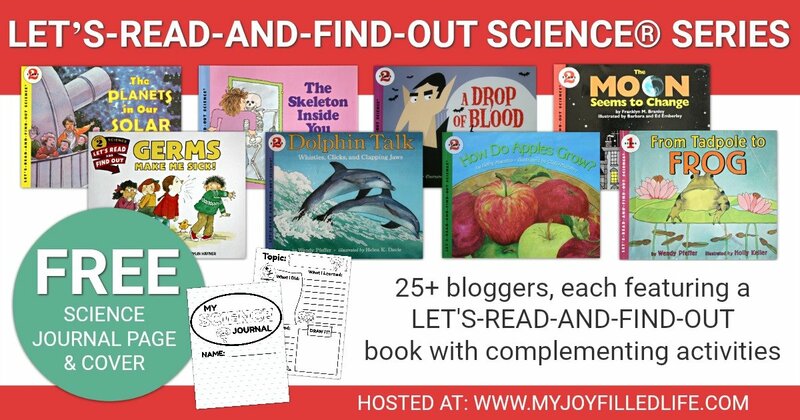 I’ve teamed up with 25+ other bloggers who will each share some fantastic books with accompanying activities from the LET’S READ AND FIND OUT series of books. 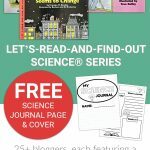 Make sure to check out all the posts and find even more great learning experiences for your children!